Amaranthine Flowers By Design offers a unique range of Hampers, these look and taste fantastic, with high quality produce only placed in all our hampers. 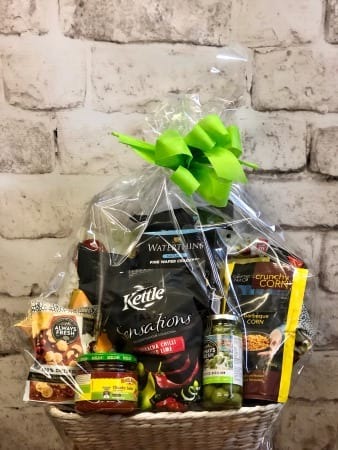 Our Savoury Hamper is full of delicious gourmet savoury treats. These make a fabulous gift to friends, family or business to business. Perfect for Birthdays, Mothers Day, Anniversary, Christmas, or just to say Thank You. Created by Amaranthine Flowers By Design Hampers are the ideal gift. Same day delivery available to all areas of Newcastle and Lake Macquarie, including John Hunter Hospital, Charlestown Square, Newcastle Private Hospital, Lake Macquarie Private Hospital, and Mater Hospital. Include a message on our complimentary gift card or enhance your flowers with one of our fantastic add-on gifts, your selection of chocolate, wine, bears, balloons, candles and many more. Same Day Delivery 6 days a week (Monday - Saturday) and Mother’s Day Sunday Delivery.